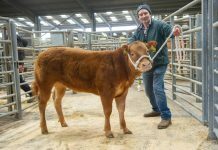 The first calved heifer Gronw Liberty, sold with her heifer calf at foot, made 5000gns to top the Dispersal Sale of the Gronw Limousin Herd of John and Heather Phillips, Esgerddeugoed, Cwnfelin Mynach, Whitland, held at Whitland Livestock Market on Saturday 8th December. The June 2015 born Gronw Liberty is by Tomschoice Gladius and is out of the herd’s French bred cow Ubaize. Her March born heifer calf at foot, Gronw Opal, is by the herd’s homebred stock bull Gronw Logan. 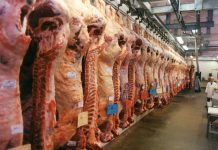 Purchasing the top price unit was Mr T Jenkins & Son for their Torycoed pedigree herd at Torycoed Farm, Rhiwsaeson, Pontyclun, Mid Glamorgan. 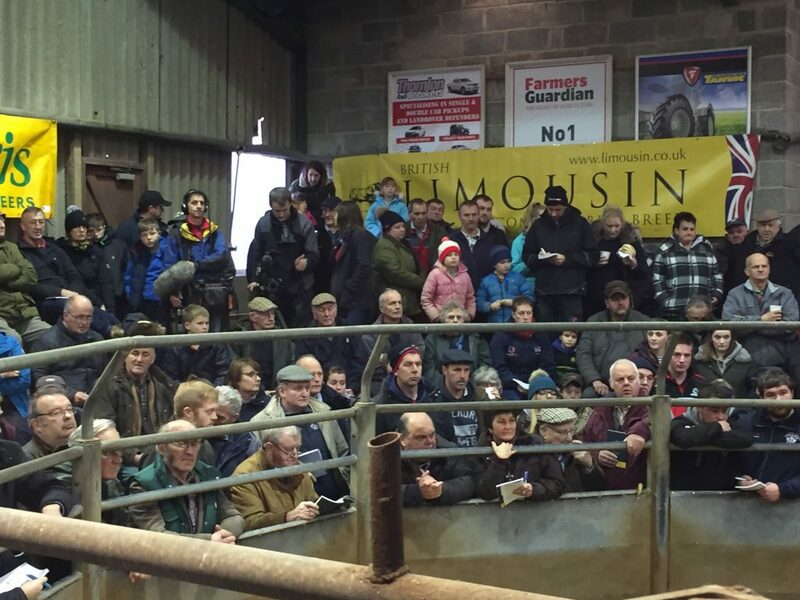 The sale, coming twenty-eight years after the Gronw herd was first established, saw eighty lots sell to what was described by the auctioneer, Gareth Thomas of JJ Morris, as perhaps the biggest crowd seen at a livestock sale held in Whitland Livestock Market. 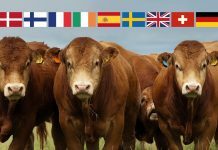 Eighty lots in all sold to gross a healthy £183,382.50 with 47 females with calves at foot averaging a very solid £2721. 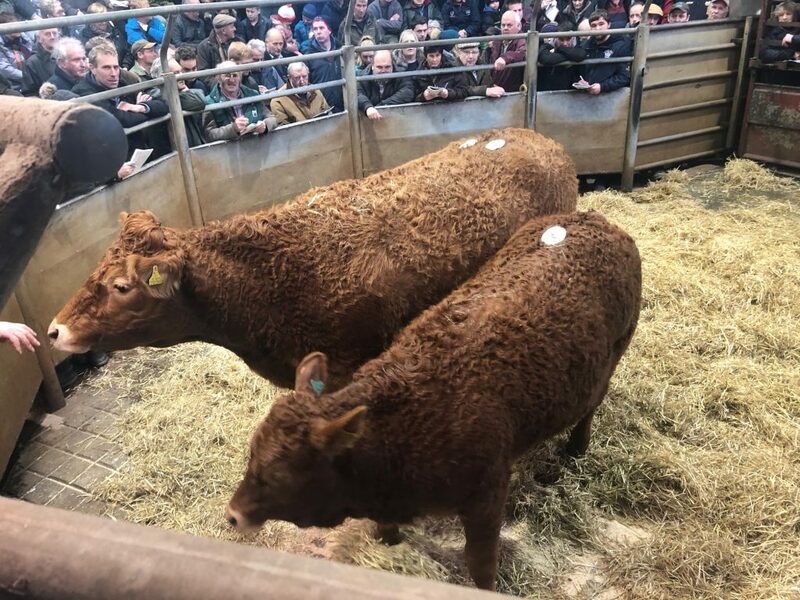 Commenting afterwards BLCS Chief Executive Iain Kerr said: “The Gronw Herd comprised of tremendously genuine cattle with a very commercial relevance. 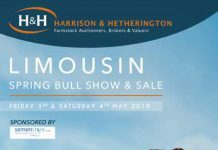 It was great to see John and Heather get such good reward for what was clearly a very well thought out breeding programme over a number of years. Everyone in the Society wishes John and Heather well for a long and happy retirement”. Another first calved heifer, Gronw Llawen, made 4000gns when selling to WG Davies & Son, Gelli Farm, Hirwaun, Mid Glamorgan for their Gellibenuchel herd. March 2015 born Gronw Llawen is by the AI sire Ironstone Brandy and out of Gronw Happy. She was sold with her March 2018 born heifer calf at foot Gronw Oren, an Ampertaine Commander daughter. 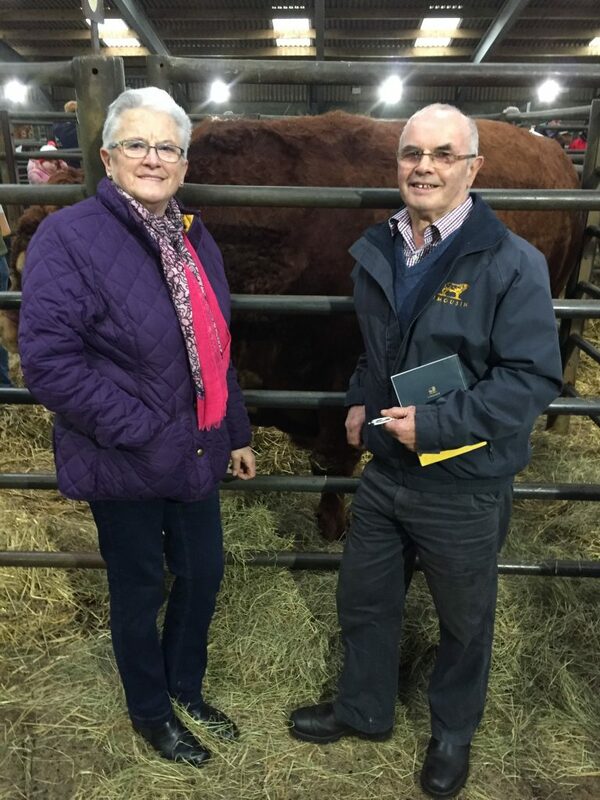 Later in the sale WG Davies & Son paid 3600gns for Gronw Lena, another first calved heifer, sold with her heifer calf at foot Gronw Oprah. The April 2015 born Gronw Lena, who was Pd’d back in calf to Tynewydd Mealamu, is by Frewstown Gargantuan and is out of Gronw Helena. The March 2018 born Gronw Oprah is by the homebred stock bull Gronw Logan. 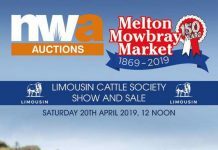 Selling as separate lots the combined unit of Gronw Jan and her first calf, the heifer calf Gronw Olivia, made 3880gns. 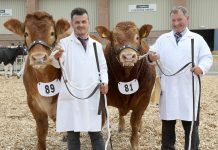 Gronw Jan, who was PD’d back in calf to Mynach Igor, is by Netherhall Dobleoseven and is another out of Ubaize the mother of the top price animal. 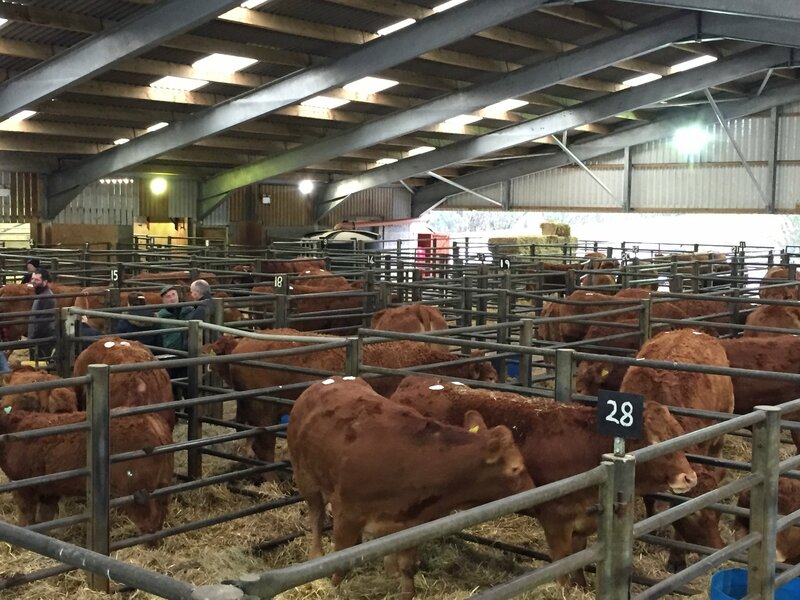 Gronw Jan made 2300gns when selling to Mr D Thomas for his Treweryll Herd at Dolau Newydd, Blaenffos, Boncath, Pembrokeshire. 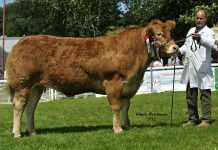 The February 2018 born Gronw Olivia, by the noted AI sire Talent, was snapped up for 1550gns by Irwel Jones, E & H M Jones & Co, Aberbranddu, Cwrty Cadno, Pumsaint, Llanwrda for his Rabar pedigree herd. Early in the sale the seven-year-old cow Gronw Gwenno, with her heifer calf at foot Gronw Ola, made 3200gns when selling to RM & G Watkins. This cow is another by Fleethill Dazzler, a Cloughhead Umpire son, and is out of the Objat sired Gronw Darla. 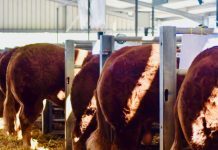 She was sold with her fourth calf at foot, the April 2018 born Gronw Ola by Mynach Igor. 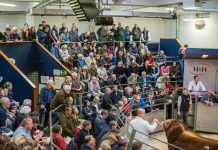 In all, thirteen lots on the day sold for 3000gns or more.